Apart from the daughter who has just divorced her husband, are the other 3 children of Princess Irene married or in serious relationships? I believe prince Carlos has a girlfriend, Martha. Princess Margarita has a boyfriend, Tjalling, since a year. And prince Jaime and princess Carolina are in serious relationships too, but I don't know any names. is still married to dr. Edwin Willem Karel de Roy van Zuydewijn. The legal divorce is planned in November 2006, if all goes well. But her husband is trying everything to slow down the procedure. As tintin in Africa, according to the newspaper. A year ago Prince Jaime de Bourbon de Parme, the youngest son of Princess Irene and Prince Carlos-Hugo, travelled through Africa. It was a search for the source of all the wars on the African continent. Prince Jaime: "We travelled with the question in our minds: how is it possible that a continent, so rich in materials, remains so poor and is plagued again and again by wars?" During six weeks Prince Jaime travelled through Sierra Leone, Liberia and Congo. Prominent leaders, supporters from the former Liberian dictator Charles Taylor and eye-witnesses tell theor stories to the Prince. "I give the opportunity to both the offenders as to the victims" so stated the Prince "during our voyage we came to the conclusion that we all in the West -unconsciously- are partly responsible for what happens in Africa. All the conflicts are about money, diamonds, raw materials, hard wood, gold. As long as the international consumer keeps buying goods from these conflict areas. they -unwantedly and unintendedly- supports the purchase of arms and the wages of these soldiers." 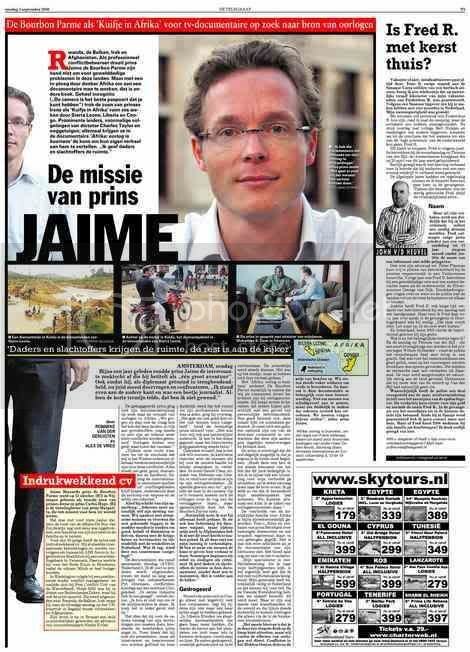 Prince Jaime (33) has worked in conflictuous areas for years and is in the interviewer in these series. The Prince managed it to let people make bold statements. For an example Daniel Chea, the Liberian Minister of Defence who simply shows his pride about his own war-crimes and atrocities. The documentary is shown in three parts on 5, 12 and 19 September 2006 on Netherlands 2.
wow, the resemblance with his cousins Friso and Constantijn is just uncanny, isn't it! Prince Jaime de Bourbon Parma has been selected by the World Economic Forum as one of the 'young worldleaders', another person on the list is Queen Rania. Princess Mabel and the Prince of Orange have been selected for the list in previous years. I always have mixed feelings when I read things like this. My overwhelming thought is: good for him, glad to see he's doing something constructive with his life, unlike a vast amount of trustfund kids out there. On the other hand, I'm always a bit sceptical when it comes to such clear cases of nepotism (in the case of how, most likely, this guy got his job in the first place, as well as Willem Alexander). Not to mention the fact that the guy's yet another Euro bureaucrat, yeehaw. I mean, he isn't a Ghandi, or a Nelson Mandela. Or a Bill Gates who climbed up against a ton of odds only to give his fortune away now he's reached the pinnacle. Wonder what's next in this sense, consumerist-and-then-some Madeleine of Sweden as a world leader? Edit: the only one there who got there on her very own merits is, in my opinion, Mabel. Whether or not she'd have married her prince, she'd have been on that list anyhow, because of her own sheer contributions and merit. Not so Alexander, not so Rania. Well, the magazine doesn't judge about how these people have obtained such a position, they just state that these people probably are in this position. If we got rid of all the people who were favoured by a social network/ nepotism I think we would not have many politicians, diplomats, CEO's etc. left, do you? I think it is safe to assume that Jaime's family background opened many doors for himj, but in the end he still has to prove himself. The doors didn't open in a simular way for his older brother Carlos for example, or even for his van Vollenhoven cousins. ..which is why I'm giving him the benefit of the doubt. But he isn't as clear a case as Mabel who really got to where she is (and I don't mean her marriage to Friso) on her own merit, there's no doubt in my mind about that. Well, the Princes and Princesses de Bourbon de Parme are practically invisible in Dutch society, with the notable exception of Margarita, of course. But I agree, being a result of a marriage of HRH The Duke of Parma and HRH Princess Irene of the Netherlands, Princess of Orange-Nassau, Princess of Lippe-Biesterfeld will for sure have opened doors to them. But that is no difference for members of the family Heineken or Philips either. Charlène Heineken (daughter of the beer-magnate) or Warner Philips (son of the electronics mogul) will have experienced wide open doors as well, purely by the sound of their name. Recent surveys have shown that also noble titles and names, in the oh so egalitarian (labelled) Netherlands does open doors wide. A Lady Myriam-Thérèse Countess de Marchant et d'Ansembourg applying for a job as solicitor will have much more chance than a Miss Annie Smith, so to say. Maybe it is scandalous, but theory is by far not always the practice, especially not in the Netherlands. To say it stronger: Lady Myriam-Thérèse most likely does not even need to apply: she will be asked via-via the social network. Jaime De Bourbon Parme is a Member of Cabinet of Neelie Kroes, the Commissioner for Competition at the European Commission. He recently made a documentary series on war economies in Sierra Leone, Liberia and Congo. Previously, he was a Diplomat and Political Adviser to the Peacekeeping Mission of the Provincial Reconstruction Team in Northern Afghanistan and in 2003 was Diplomat and First Embassy Secretary at the Royal Netherlands Embassy in Baghdad. Between 2001 and 2004 he also served as Policy Adviser at the Peacebuilding & Good Governance Unit At the Ministry of Foreign Affairs. Prior to joining the public sector he worked as an analyst for ABN AMRO Bank. Jaime holds a BA from Brown University, an MA from Johns Hopkins University-Paul H. Nitze School of Advanced International Studies (SAIS), as well as a certificate from ABN AMRO Academy and the Government Training Institution (ROI). Thanks for posting that link Lucien. Is this an oficial site for the family? If it is I would have expected them to include some other members of the famly to (Queen Anne of Roumania comes to mind) and as it is the Ducal familyof Parma it would be appopriate if the text was available in Italian too. 'Zeeuws Licht, Mondriaan in Domburg' at the Gemeentemuseum in The Hague on April 27th. Thanks for pointing that out Zarat, I must have missed it. I always found it rather curious that the Bourbon-Parma's are profiled as being French or even Spanish before Italian, something which never happened to the Bourbon-Two-Sicilies who are in a simular position. very interesting. And I believe it. Still, I'm sure Jaime still is expected to put in the mileage like anyone else once these doors are opened. My gosh, no matter her age, she always manages to remain the 'babe' (exusez le mot) of the four sisters, doesn't she! (though I have to say I'm glad her elder sister is the queen and not her! Of all DRF memebers, I always wondered about him in particular the following: what does he do, or rather, did he do with his life? Besides trying for the Spanish throne before 1980? What did he do the decades after that? What are his interests? This is all none of my business, granted, but I'd still like to know! He is retired now but he was a lecturer at the University of Brussels. The Prince still is president of the European Association for International Education.